I Wanna Be a Jalapeno! For some bizarre reason, I planted twenty pepper plants – twenty! Last week, I decided to pickle some of my pepper crop. While happily attempting to say that silly tongue twister about Peter Piper’s pickled peppers, I carefully began to de-stem, de-seed, and slice my pretty crop of purple, white, and green peppers. Finally I was down to one last pepper – the jalapeno. I’d worked with jalapenos before, and they hadn’t burned my hands, so I was quite confident that I’d be fine. I sliced the stem off the top of Mr. Jalapeno and the burning oils instantly burned my nostrils. Now, you’d think that would be enough to deter me and make me retrieve gloves, but I’m not that smart. I continue to slice and deseed the Jalapeno, only to feel the burn starting slowly on my hands. It didn’t take long for me to regret my decision to brave it out. My lungs were burning with each breath and my hands weren’t much better. To make things worse, at some point in time, I must have pushed the hair out of my face because my forehead and cheek were burning as well – OUCH! No matter what I tried – water, soap, hand cleaner, nothing could help the burn that was stuck on my hands. I continued my pickling and canning in spite of the burn, which was getting worse by the minute, I couldn’t shake it! As I was trying to find something that would offer relief, I was thinking and decided that Christians should be a bit more like Jalapenos. When we meet someone, especially non-Christians, we should leave a lasting impression on them. An impression that persistently continues to tug at their hearts, like Jalapeno oil on the skin. We have the Spirit living in us, and we shouldn’t hold Him in, but let His love shine through us in everything we do, and on to each person we come into contact with. I pray I will be a little more like a Jalapeno each day. 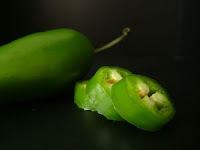 By the way, a product called Technu works to remove Jalapeno oils from your skin. It is marketed for poisen ivy/oak/sumac. Water just makes it worse. Just in case you decide to pick a peck of pickled peppers without gloves (I don’t recommend it). Amber, green juice is fresh vegetable juiced made of dark leafy greens, a cucumber, and a green apple. You absorb the nutrients straight into the bloodstream in less than 15 minutes and it gives your digestive system a break so that energy can go to healing. Hi- I just found your blog, I am 17 and have RSD in my left foot/ankle. Sounds like you had a tough spring… So did I- But you made it through despite what everyone was telling you and what you were dealing with. That takes strength and determination. You should be proud. Check out my blog if ya get a chance….